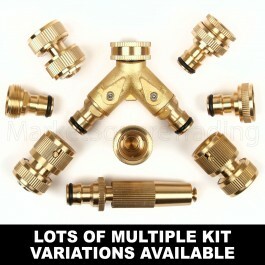 A high quality selection of brass tap and hose fittings. The main advantage of the brass fittings are the strength and length of time they last against plastic ones. There are many options to choose from so you can set up your watering system to just the way you like it and be confident of it lasting you many years without leaks springing up everywhere due to frost and rough useage. If you do want plastic fitting kits I have many more in my store so please feel free to have a browse around as I am sure you will find the perfect kit for your needs.